It takes a minimum of four hours for a new freezer-only appliance to cool enough to add foods. Units that also include a refrigerator may require a full day before adding food items. While it may be tempting to transfer food to a new freezer as soon as it's set up and plugged in, that's not the best option. Freezers take time to stabilize and to reach temperatures cool enough to keep foods frozen. 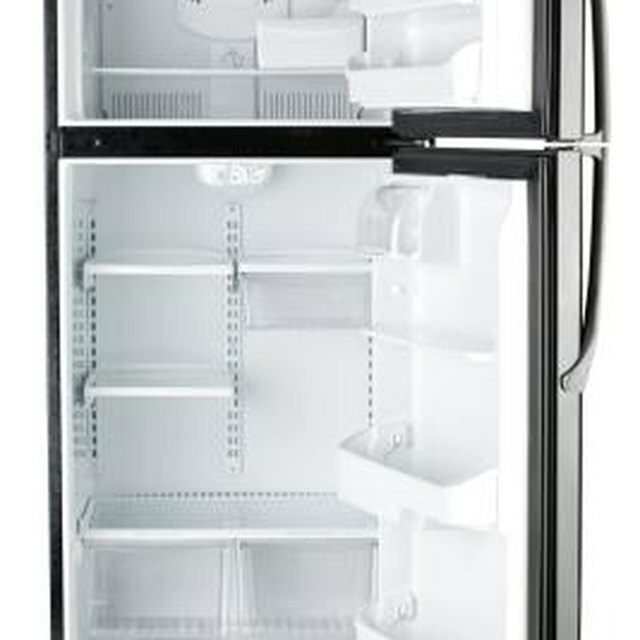 Stand-alone freezers generally take at least four hours before food can be added, while units with both a refrigerator and freezer can take a full 24 hours. Even though the freezer is new, cleaning it before use helps remove any chemical odors or residue that may be left behind from manufacturing. Mix one tablespoon of baking soda into a quart of warm water, stirring until the powder dissolves. Dip a clean sponge or dishcloth into the solution, wring out excess water, then wipe down the inside of the freezer compartment before plugging in the freezer. Clean the shelves, ice cube bins and even the walls and ceiling inside the freezer area. Rinse the inside by wiping everything down with a clean damp cloth. Pat dry any areas that seem excessively wet. General Electric recommends plugging in a freezer and setting it to a mid-range temperature level, such as a 4, when first setting up a new appliance. Wait four hours after plugging it in, then touch the inside of the freezer to ensure that it feels cold before adding food. If the freezer compartment doesn't feel cold enough but is cool, wait several more hours, keeping the door or lid closed on the freezer during this time. The four-hour wait time is recommended by GE and Kenmore for both upright and chest freezers. Kenmore suggests that items already frozen can be added to the freezer after several hours, but items not already frozen should not be added until after the full four hours. Refrigerator/freezer units take a bit longer to cool safe temperatures than freezer-only appliances. General Electric and Whirlpool recommend a full 24 hours after plugging the appliance in before adding food to either the refrigerator or freezer section. Many GE models already have the freezer compartment set to a recommended starting temperature, so there's no need to change this before plugging in the appliance. The best way to ensure that the freezer's temperature is cold enough to safely freeze foods, purchase a refrigerator/freezer thermometer and place it inside the freezer where it's easy to read. Close the door and wait 15 minutes or the amount of time recommended by the thermometer's manufacturer before checking the temperature. The freezer temperature should be 0 degrees Fahrenheit or colder. While water freezes at 32 degrees, food items have varying water and fat content, requiring a colder temperature to freeze. Whirlpool: How Long to Wait before Adding Food to Refrigerator? Kathy Adams is an award-winning writer. She is an avid DIYer that is equally at home repurposing random objects into new, useful creations as she is at supporting community gardening efforts and writing about healthy alternatives to household chemicals. She's written numerous DIY articles for paint and decor companies, as well as for Black + Decker, Hunker, Landlordology, SFGate and others.